All of our estate vineyards are dry-farmed, and because of this we diligently track precipitation. A mere fourteen inches of rain fell during a nail biting "rainy" season, forcing us to severely reduce output on our Pinot Noir vines due to drought-stress. This fruit kicked off the 2014 Harvest on August 4, an unprecedented early start. 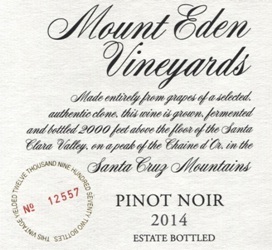 Our Pinot Noir is a natural wine reflecting the place and the vintage. The crop may have been small, but the concentration and depth correspondingly increased. Classic blackberry/raspberry aromas greet you along with a deep ruby color. On the palate, great balance and acid/tannin tension continue. Despite the considerable concentration of red fruit, the all-important element of freshness is in abundance. We ship orders out on Mondays and Tuesdays.